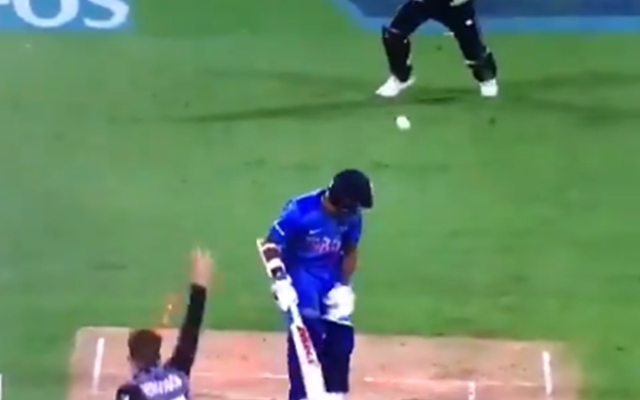 India suffered a disappointing loss against the Kiwis in Wellington in the first T20I. Not only did the Black Caps dominate the visitors’ bowling, but they also bundled India for a total of 139. Put to bat first, New Zealand managed to post a total of 219/6 on the board. The Indian pacers were taken away for the cleaners especially by Tim Seifert’s 84(43). While India lost skipper Rohit Sharma early, they still managed to get a good start. However, a batting collapse reduced India from 51/1 to 77/6. With the required rate soaring high and no wickets in hand, India were already staring at a defeat. Tim Southee picked up three wickets as he led the bowling charge for the hosts. Shikhar Dhawan was looking really comfortable at the crease for a while. After starting with five dot balls, the left-hander got off the mark with a couple of sixes. The 33-year-old was off to a flier start before he was dismissed by Lockie Ferguson. The dashing opener was taken aback with a speeding delivery aimed at 151 kph. It was a pacy yorker from the bowler which Dhawan couldn’t handle. The bamboozling pace from Ferguson ended up rattling his middle stump. Dhawan could do nothing but stare as he walked back to the pavilion. On the other hand, Ferguson was thrilled to get the important breakthrough. There’s no better sight in cricket for a bowler than ripping apart the stumps. Ferguson ended up picking a couple of wickets. Moreover, Dhawan was looking dangerous and his dismissal paved the way for a collapse in the Indian batting order. Soon enough, India lost the plot and headed towards a huge 80-run loss against the Black Caps. India have never won a T20I in New Zealand. The only couple of occasions that the Men in Blue have emerged victorious over the Kiwis came in the 2017 series at home.